The Ebola crisis in West Africa has led many in the global health community to consider how their work relates to the situation, both in the present and going forward. Those focused on Community Health Workers (CHWs) are keenly aware of the Ebola crisis, as front-line workers can be decisive in the success or failure of crisis responses. 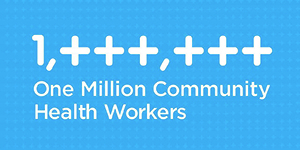 The One Million Community Health Workers Campaign recently posted an important article on the critical role of CHWs in epidemic situations like Ebola, highlighting the need for community knowledge and sensitization, contact tracing and surveillance. The article notes the necessity of training community-based and other health workers on Ebola control activities, sensitization techniques, and safety measures. Accurate information dissemination by CHWs can not only help control Ebola infection but also help lower the risk of indirect deaths caused by misdiagnosis of conditions like malaria, which present in similar ways to Ebola. More broadly the Ebola outbreak stresses the importance of strong community-based health systems that have the ability and capacity to do surveillance and respond to epidemics. More and better aligned investments in integrated community care are required in many countries to strengthen this part of health systems. The MDG Health Alliance is pleased to see that on-the-ground partners are working with the governments of Liberia, Sierra Leone and Guinea to provide rapid CHW training. These include UNFPA, the International Rescue Committee, the International Federation of the Red Cross, and Last Mile Health. Following is the complete article posted by the One Million Community Health Workers Campaign on August 21, 2014. Ebola viral disease is a severe, often fatal illness that is transmitted by direct contact with blood, bodily fluids, and tissues of infected animals or people. As of August 15, 2014 there have been 2,240 cases of Ebola and 1,229 deaths from Ebola in Guinea, Liberia, Nigeria, and Sierra Leone. The difficulty in controlling the spread of the virus has caused the 2014 outbreak to be the most severe in terms of number of cases and human fatalities since the discovery of the virus in 1976. The virus transmits easily amongst humans who are in contact with bodily fluids from those who are infected with and symptomatic of Ebola virus. All human cases in 2014 (with exception of the index case(s)) were believed to have been exposed through other humans. Human-to-human transmission can be caused by an inability to seek care when ill and failure to follow safe burial and health care practices. Additionally, lack of basic infection control measures such as hand hygiene, use of personal protective equipment, cleaning and disinfection measures, and waste management increase risk of transmission. Lack of information or communication about the disease can lead to unsafe interaction with Ebola patients or unwillingness to cooperate with health workers. In August 2014, for example, a Liberian quarantine center was destroyed by protestors who had misconceptions of Ebola as a government hoax, or who were frustrated with patients being brought into the capital. As CHWs are often trusted members of the community, they can play a key role in promoting Ebola awareness by disseminating accurate information about Ebola and counseling on protective methods. This should include providing instructions on proper burial method to the relatives of the deceased, ensuring that patients go to a treatment center if symptoms emerge, detecting symptoms amongst community members, and counseling on basic infection control and sanitation measures. Controlling an outbreak requires rigorous assessment and follow-up of exposed cases. This requires identifying all people who may have been exposed to a person with Ebola and checking for signs of illness every day for 21 days – the maximum number of days of Ebola’s incubation period. Those who begin to develop Ebola symptoms should then be isolated to avoid further transmission, and then their contacts also traced and observed for 21 days. Given CHWs’ ability to provide basic health surveillance in their communities, they can play a key role in controlling the outbreak if done carefully with proper safety precautions and adequate supervision. UNFPA has worked with the Government of Sierra Leone to conduct contact tracing to identify people linked to confirmed or probable Ebola cases using CHWs. CHWs were trained to identify household members with possible symptoms as well as people who may have been exposed. This data is sent to the District Surveillance Officer and the Government-manager District Ebola Task Force. Additionally, individuals who are identified by CHWs with symptoms of Ebola can be monitored closely. In Guinea, the CDC has trained CHWs to follow up on people who were exposed to Ebola for 3 weeks, checking on symptoms and reporting findings to a supervisor. Reported cases would then be tracked and sent to treatment centers with the hope of avoiding further transmission. Given the need for interaction with possible exposed patients, this contact training method would require rigorous training on safety precautions, appropriate equipment, and supervision to not only reduce the risk to the CHW, but also the risk of spreading the virus to other households. The 1mCHW Campaign would like to stress the importance of the fact that any health worker interaction with possible Ebola cases requires the strictest safety precautions. Health workers risk infection while interacting with symptomatic patients due to close contact with bodily fluids. Specific training on special care to avoid exposure to a patient’s blood and bodily fluids (as well as the use of face protection and gloves) can help to protect community health workers. If CHWs are recommended to partake in contact tracing, it is essential that adequate measures be taken to protect them from exposure and reduce risk of transferring to other households. Rigorous training should be provided to CHWs on Ebola control activities, sensitization techniques, and safety measures. Additionally, CHWs should be thoroughly tested on their knowledge of these procedures to ensure that ability to adhere to proper protocol. It will be vital to ensure standardized training, proper supervision and equipment, and regular quality assessment of these activities for a robust response at the community level to assist in Ebola control efforts. The 1mCHW Campaign believes that investing in community health workers, as a formal part of the health system response to Ebola, will be critical in containing the outbreak and protecting communities. Ministries of Health in many West African countries, with support from the 1mCHW Campaign, have been developing community health worker deployment plans as a part of a general primary health care strategy. However, urgent funding is needed to be able to deploy these CHWs with special emphasis on Ebola response. There have been strong examples thus far on the use of CHWs in community sensitization and contact tracing of Ebola patients. Proper investment on the professionalization of a larger scale CHW program will be key to containing the outbreak and strengthening fragile health systems.